Size of this preview: 747 × 599 pixels. Other resolution: 748 × 600 pixels. Render this image in Deutsch (de) English (en) español (es) français (fr) Nederlands (nl) português (pt) русский (ru) . Deutsch: Grafik zur Darstellung einer "hierarchy of disagreement" basierend auf dem Essay "How to Disagree" von Paul Graham. 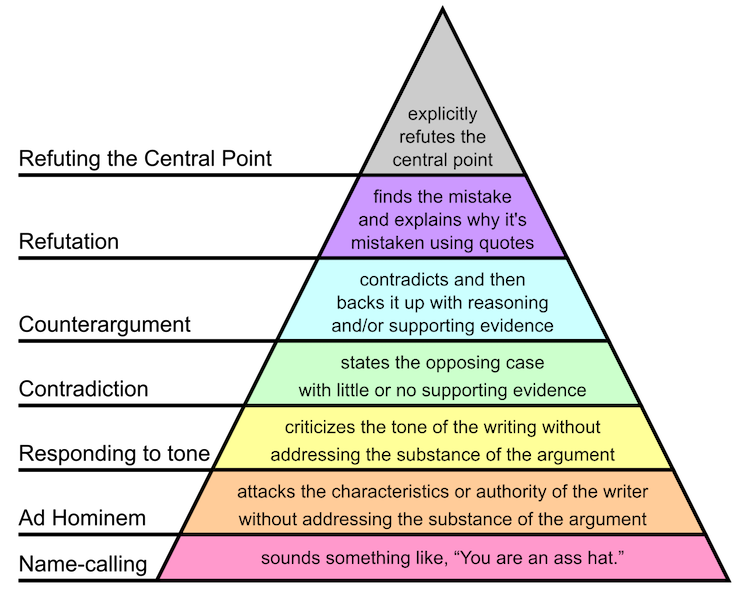 English: A triangular graphic representing a "hierarchy of disagreement" from clear refutation to mere vituperation, based on the essay "How to Disagree" by Paul Graham. Español: Un gráfico triangular representando una "jerarquía de desacuerdos" desde la refutación clara hasta la mera vituperación, basado en el ensayo "How to Disagree" según Paul Graham. Français: Un graphique pyramidal illustrant les différentes possibilités de réponse lors d'un débat. Le graphique est inspiré de l'essai "How to Disagree" de Paul Graham. Nederlands: Een driehoekig diagram dat de "Hierarchy of disagreement" ("Hiërarchie van onenigheid") voorstelt, van duidelijke weerlegging tot eenvoudig uitschelden, vrij naar Paul Graham[ext]. Português: Um gráfico triangular representando a "Hierarquia das diferenças", da clara refutação à meros xingamentos, com base no ensaio "How to Disagree" de Paul Graham. To embed this file in your language (if available) use the lang parameter with the appropriate language code, e.g. [[File:Graham's Hierarchy of Disagreement.svg|lang=en]] for the English version.